Two Bears Farm and the Three Cubs: GIVEAWAY!! Andrea at Good Girl Gone Redneck is hosting a giveaway for me! My mom made several of these cute aprons for Pierce's birthday party (which for various reasons never happened). So! 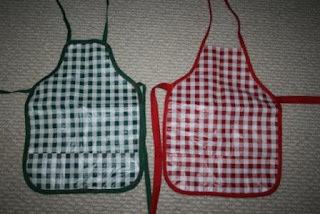 I am giving away one apron to a lucky reader - winner picks the color. To see how to enter just head over to Good Girl Gone Redneck. These are made from an easily wipeable surface, so they are great for cooking and also for craft activities. Good luck!